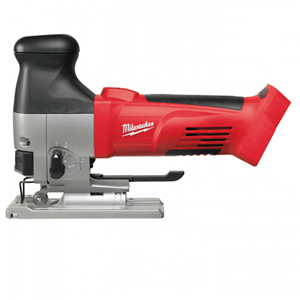 The Milwaukee HD18 JSB 0 M18 Body Grip Jigsaw has a two speed selector switch which makes it an ideal tool for use in different materials. This Jigsaw has Milwaukee FIXTEC which has keyless base plate adjustments with snap-in feature at 0° and 45°, the FIXTEC also provides a blade clamp for fast and easy keyless blade changes. This model has exact saw blade guidance with a large blade support roller on needle bearings fitted in a very low position. For increased cutting performance and longer saw blade life the HD18JSB has a four-stage adjustment of the pendulum action. Body only - battery and charger sold separately. The new style Milwaukee 18v Red Lithium-Ion batteries are much more compact and lightweight in comparison to the older style Nicad and NiMH. They are capable of up to 50% more charge cycles and up to 40% more run time. They have a unique built in fuel gauge which enables you to see how much charge is remaining in your batteries so you have advance warning to get them re-charged before your next job.